Normally two types of mustard varieties are seen (i) Brassica hirta mainly generates the white and yellow types and (ii) Brassica juncea. 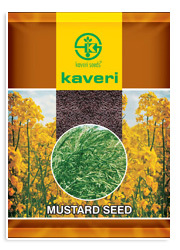 is the main producer of mustard seeds like brown and oriental. All such mustard seeds reveal the prickly type of taste. The main origin of the mustard seed is Canada and then brought in America. It is assumed that mustard existence is five centuries earlier than Christian era. Mustard is an important spice in many regional foods and may come from one of three different plants: black mustard ( B. nigra), brown Indian mustard ( B. juncea) or white mustard (B. hirta). It has a religious significance, in the Bible Jesus tells the Parable of the Mustard Seed referring to faith and the Kingdom of God. The earliest reference to mustard is in India from a story of Gautama Buddha in the fifth century BC. Mustard grows well in temperate regions. Major producers include Canada, Nepal, Hungary, Great Britan, Pakistan and the USA. Mustard seed is a rich source of oil and protein. The seed has oil as high as 46-48%, and whole seed meal has 43.6% protein.